As the weather turns colder, I always think about making soup. Perhaps it’s because I start craving warm, hearty foods and seem to have a larger appetite. I like to make soup in large batches because it doesn’t take that much extra time, and I can freeze any leftovers for later. 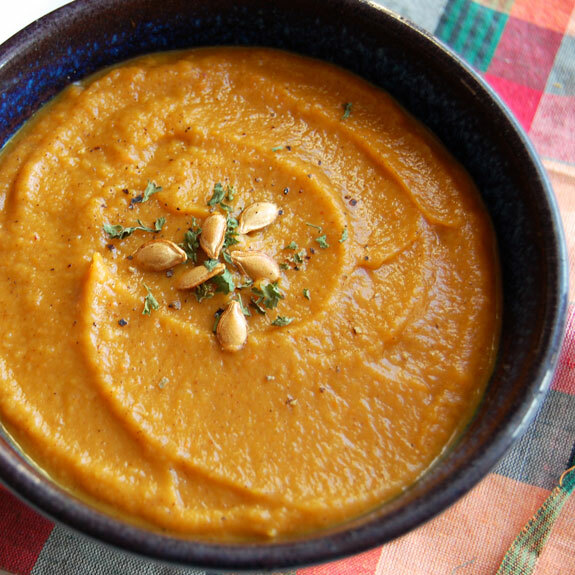 This squash soup is transformed from an ordinary recipe into an extraordinary one by adding spices that taste of fall and by roasting the main ingredients. The ingredients are quite simple: a squash, an apple, an onion, and carrots. A little bit of tartness from the green apple balances the sweetness of the squash, with some heat added by chili powder. Multiple levels of flavor develop wonderfully together from the spices added throughout the process. First things first. How do I take a store-bought squash and transform it into something I can cook? To prepare a butternut squash, first cut a thin slice off the bottom of the squash so that it can stand flat on the counter and is easier to handle. Next, peel off the outer layer off the squash. 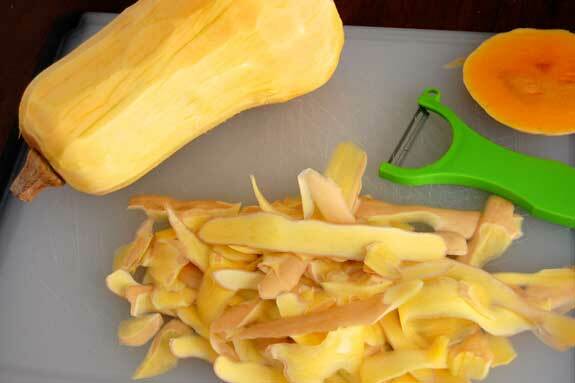 Then, using a sharp large knife, cut the squash in half lengthwise, and scoop out the seeds. You can either discard of the seeds or rinse them and roast in the oven. Lastly, dice the peeled and seeded squash into cubes. Of course, you could also buy pre-cubed squash from the grocery store to make life a little easier. For this recipe you don’t need to worry about making the cubes uniform, because they will be blended eventually. The same goes for the shapes of the sliced apple, onion and carrots. Everything is roasted in the oven after being tossed with some spices, and then combined in a large pot with some chicken stock to simmer. The more chicken broth that you add, the soupier it will be. As you may be able to tell from the photos, I usually prefer heartier, thicker soups. Those kinds of soups usually call for adding cream or dairy, so I really love this healthier option, which only adds broth. You can probably guess what I use to make it all come together. The immersion blender strikes again. After all of the ingredients are done roasting, you simmer them together in a large pot with the chicken broth and some added spices. Then puree with an immersion blender until it reaches your desired consistency. The end result is a creamy, delicious and ridiculously healthy soup. It is a perfect fit for the fall and bursting with flavor. 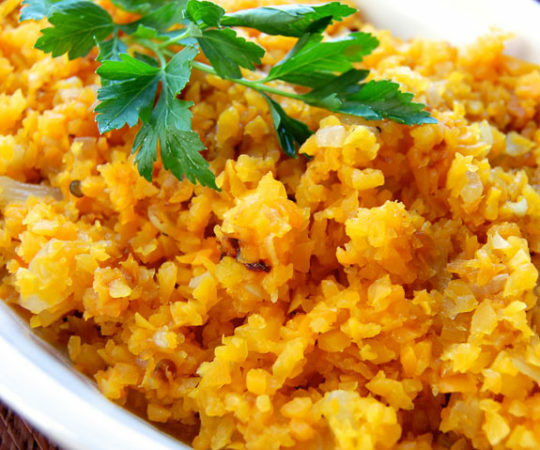 Preheat oven to 400 degrees F. In a large bowl, combine the butternut squash, olive oil, 1 tsp cinnamon, 1/2 tsp salt, and 1/2 tsp cumin. Mix together, coating the squash well. Spread out on a rimmed baking sheet. Next, in the same bowl that the butternut squash was in, toss the apple slices, onion, and carrots to coat with the remnants. Place on a second rimmed baking sheet and add both baking sheets to the oven. Roast for 35-40 minutes until soft, stirring once. Heat up ghee over medium heat in a large pot on the stove. Add the roasted ingredients and then the chicken broth. Add 1 teaspoon each of salt, cinnamon and chili powder. Bring to a boil, then reduce heat to low and simmer, covered, for 20 minutes. Using an immersion blender, combine the ingredients until smooth, or transfer to a blender to puree. Serve warm. This was so easy and so delicious! This was great on a cold fall day. It was so tasty and warm going down. Didn’t have room for 2 roasting pans so put everything on one roasting pan. Quick easy clean up. Thanks! This is a wonderful and cozy soup! Thank you for posting! I had used Rachel Ray’s pumpkin soup recipe recently and swore to never try anything like it again. This was delicious and I will be saving this recipe for future meals. I just made this today and it was delicious! Thank you so much for this recipe! However I do have a question. I felt that the sweetness of the squash wasn’t appropriate for an entre. Do you have any suggestions as to how I can counteract the sweetness of the soup? 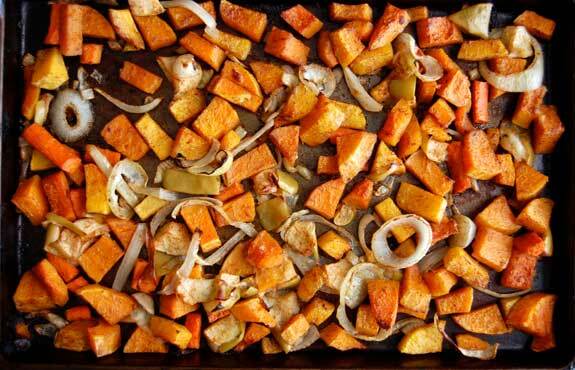 When you bake the squash, place some bacon on top of it to infuse that flavor. That’s from an old Thanksgiving recipe. I believe it helps some. I used half the cinnamon and added another teaspoon of cumin. I also added garlic and it was much more savory, much less sweet. I think the cinnamon is important but too much accents the sweetness. Go for savory! I just made it. I didn’t have chili powder so I used ground Cayenne instead. I don’t think I will ever do that again. A bit too spicy. But overall very good! The roasted butternut soup was absolutely delicious! Perfect for a cold snowy night! It was an amazing gourmet soup with a simple, easy to follow recipe. Does anyone know the nutritional breakdown? Hey Rebecca! I’m hosting a soups and comfort food dinner party in a few weeks and I was wondering…what can you substitute for the 2 tablespoons of butter and how many portions does this make? Thanks! I didn’t use ghee or bother substituting it and it was still delicious! I was wondering about that. I didn’t know what ghee was. Just made this and it’s terrific! A little hotter than I was expecting, but the more I tasted it the more I liked it! Might do just a little less chili powder next time but it was absolutely delicious! 1. didn’t roast in the oven, just cooked the ingredients in a pan over the fire. This was fantastic. I think the apple and ghee make all the difference. 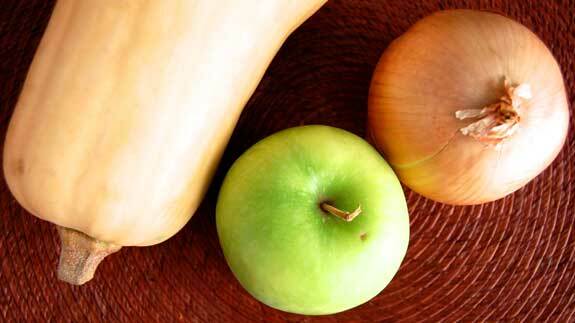 I used a tart baking apple which gave a fantastic contrast from the sweet butternut squash. I added some coriander and a dash of maple syrup. The soup turned out to be really good. Never cared for most squash growing up, but I’m growing to enjoy it as an adult. This was delish! Thank you for a tasty and simple recipe! This is very delicious, but it was a ton of work! Peeling and cubing 5# of squash probably took me 30-45min? I didn’t keep track of the time, but it felt like forever. I am looking forward to crumbling some bacon on top or toasted pecans and having it for breakfast. It is a great stand-in for oatmeal. I used my electric knife. Cut like it was butter. Costco sells a good amount of butternut squash already cubed. So do most grocery stores. 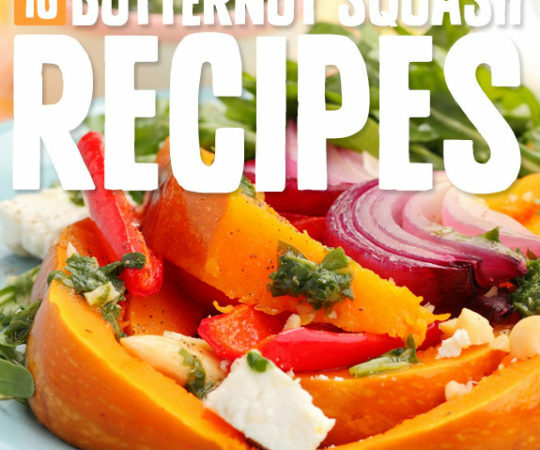 I’m with you–cutting a whole butternut squash takes an eternity! I don’t what you were doing but it took me about 5 mins to peel and cut the squash! I had never made my own butternut squash soup and this was pretty good but I found I liked it better to reduce the cinnamon, add a bit of nutmeg, cayenne, and, agree with the above comment, to cook some bacon and sprinkle it on top before serving. The bacon really added that touch of contrasting texture and great pockets of flavor. Thanks for the recipe! Just made this last night and it was so good! I’m not usually much of a soup person, and have tried and failed a couple times when attempting to make a good soup. But this was easy and delicious. Even my picky daughter loved it! 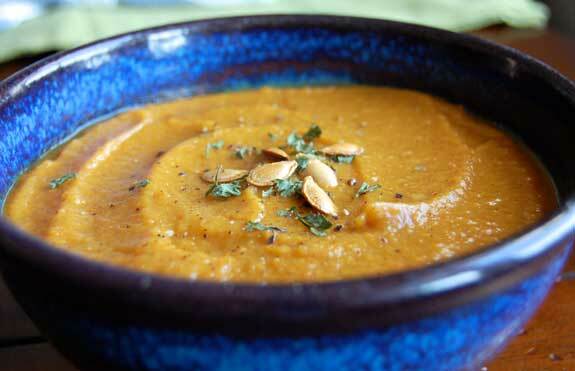 I have made another recipe for Butternut Squash Soup for years that uses plantains. I’m pretty sure my recipe is Paleo-friendly, but searched and found this one. 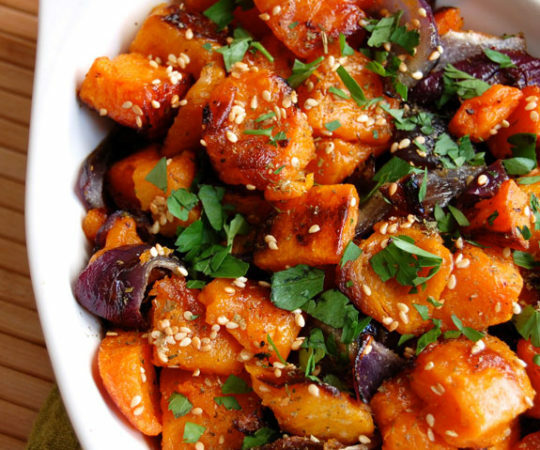 Can I substitute the carrots with Plantains? 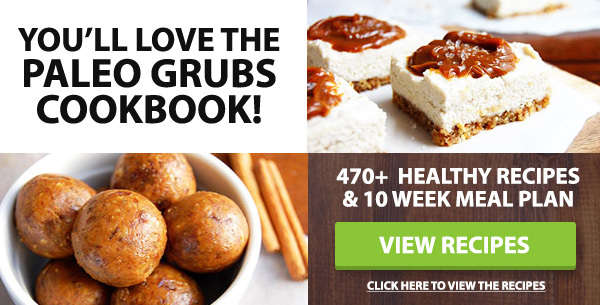 Thanks – looking forward to making this tonight! I made this recipe, and alone it is fantastic. The second time I made it, I sautéed some shallots in the ghee before I added the rest of the ingredients. Added an extra layer of flavor and a bit of spice. So good. I added bacon to it before roasting and It made it taste so rustic and delicious! This will be a starter to our Thanksgiving dinner! YES! I tripled this recipe because I like to make my soups in bulk so that I can freeze and eat throughout the winter. That was very risky given that this was my first time trying out this recipe and my second time making this kind of soup. WELL WELL WELL, I’m so glad I made a huge pot! I added garlic cloves and let them roast with the other veggies. I also sprinkled all the veggies with a little olive oil, chili powder and ground cumin so that those flavors infused into the veggies. It was so perfect. I have to force myself to freeze half of it. I can eat it all it’s so good. Thanks for sharing. This soup is so fantastic! I’ve made it like 4 times this fall/winter. Sometimes I add a sweet potato (not sure what that does to the paleo-ness), but for sure the apple makes a huge difference! Great recipe! I didn’t use ghee or substitute it and I used a Gala apple instead of a green apple, as I didn’t have any on hand. It’s super filling and find it satisfies my sweet tooth. I’ll have to experiment as some others did with garlic and other spices. I don’t like coriander, but this soup is easy and absolutely delicious with coriander! I just reduced the salt, all else the same. Thanks for a great recipe. I wI’ll certainly make this again. This is absolutely delicious and I keep coming back to this recipe because it’s one of my favorites! Sometimes, I modify and add oysters and/or shrimp to it too. It’s sooooo good! 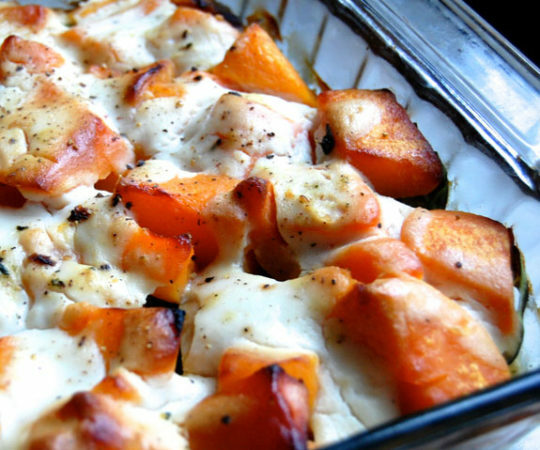 hi there, just wondering if you’d get same result with roasting a whole half butternut (and perhaps w skin on if it’s thin enough) rather than having to cube it all? or least maybe in quite big chunks? and just gauge timing as to if it’s browned and softened enough… have you tried it that way Rebecca? I’m also intrigued at the use of apple! Why put it in the oven first? I just boiled it and it tasted great. This is a wonderful and comfortable soup! It was delicious and I will save this recipe for future meals. ** Instead of butter or ghee we use coconut oil (no altered taste) and replacing chicken stock to organic vegetable stock. Making this tonight!! 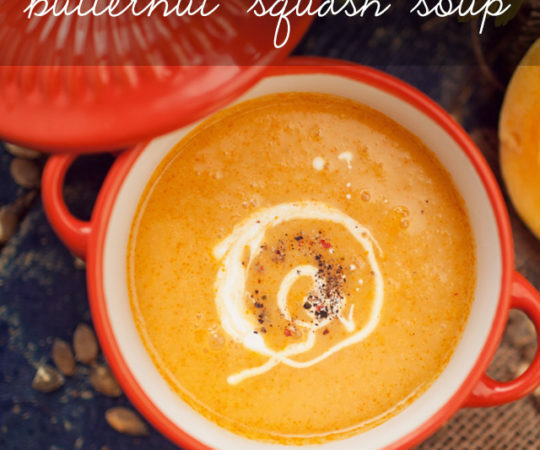 just made this yummy soup this afternoon – i used acorn squash instead and it is seriously delicious with a great texture. i did have to add an additional cup of chicken broth to get the right consistently. Made this today with a few of the suggested modifications (garlic, turkey bacon) and omg…it’s so good I want to eat the entire pot! I make this soup all the time- it’s my favorite. I eyeball the spices and sub with veggie stock to make it veg. Friendly for my husband. I’m in calorie counting mode- do you have any idea how many calories are in a serving? So soul-satisfying and comforting. Probably my favorite recipe for butternut squash soup. The family loves it too! I make this recipe every year for a Thanksgiving Appetizer. It has become a family favorite. Thanks for sharing! This soup is fantastic! I’ve made it a few times and it’s one of my hub’s and I’s favorites. Thanks for sharing! I have come back to this recipe at least half a dozen times. It is my absolute favorite soup!